If you've caught any of my baking posts you'll know that I bake regularly. This means I've got a god stock of the basics in my store cupboard ready to go but purchasing all these ingredients initially can be really expensive. That's where Aldi come in because with their 'The Pantry' range you can stock up at the fraction of the cost of regular supermarkets. 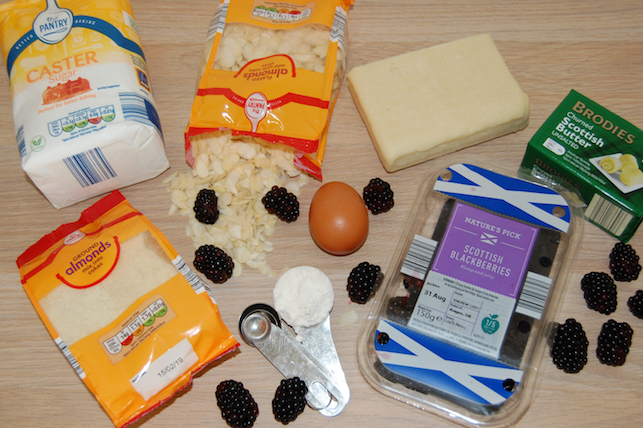 All these ingredients for example cost me only £8.31 and I have plenty of the basics to try another recipe too. Roll the pastry onto a floured surface until it is about 2mm thick - you want it nice and thin for a recipe like this. Cut 12 circles out of the pastry around 7-8cm in diameters (a fluted edge cutter would be useful here but I don't have one). Then place these into a 12 hole bun tin. Cut 12 squares of baking paper just bitter than the pastry to cover them and fill with baking beans (or rice like I did). Bake the pastry bases blind for 10 minutes then a further five after removing the baking beads. 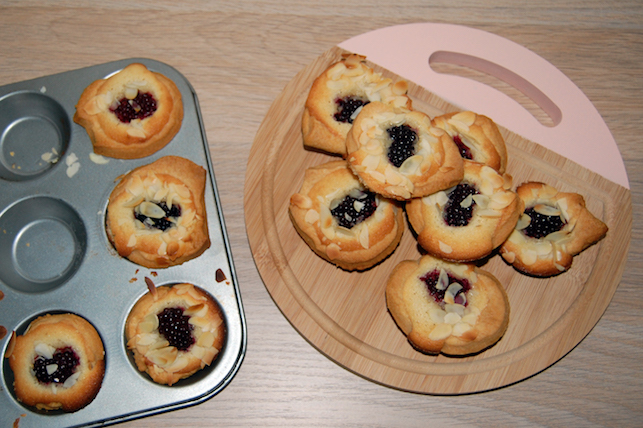 Finally divide the cake mixture between the pastry cases placing the blackberries on the top as you go. Just before they do in the oven sprinkle the flaked almonds on top and bake for 10-15 minutes at 180 degrees until the sponge is golden and cooked through. Mine don't look perfect because I cut the circles by hand but they tasted really good! Aldi also have lots of other baking recipes on their website to get you inspired. I also picked up this wooden board in Aldi because I thought it would look good in my Instagram shots. How can you not get sucked in by the middle isles? saving money is all mine.